This cartoon was Thomas Nast's final shot before the 1872 presidential election on November 5. It presents the Greeley coalition of Liberal Republicans and Democrats as pirates futilely attempting to overtake the Republican Ship of State. The latter flies the Stars and Stripes, labeled "U.S. Grant," with Uncle Sam and possibly Columbia aboard. 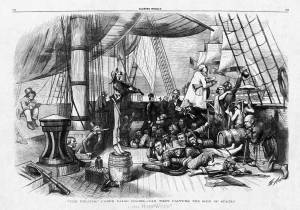 The stealthy crew of partisan cutthroats lies low prior to making their move, while the vessel appears to be under the nominal direction of candidate Greeley, with "N.Y. Tribune" speaking-trumpet and booklet "What I Know About Shifting." First-mate Whitelaw Reid plays a violin labeled "This Is Not An Organ," as he stands tiptoe atop a barrel of "Gun Powder Newspaper Lies" which seems likely to explode. The "False Colors" of the title are listed on the sail over Reid's fiddle: "Journalism," "Love," "Peace," "Reconciliation," "Christianity," and "Reform." Nast's composition is a faithful and witty parody of "Le Bateau Pirate" (1851), a painting by the French artist August François Biard.